Cupcakes are one of my favourite sweet treats! I love the variety of the combinations and the flexibility they give you to customise them according to your taste and mood! ​For the frosting I used the liqueur version which can also be odered online http://www.greekfoodshop.com/en/mastic-liqueur-homericon-500ml.html . The taste is the same so in the recipe I give both options. In Greek desserts mastic is usually combined with pistachio thus in my first attempt I decided to combine the two. ​In Greek desserts mastic is usually combined with pistachio thus in my first attempt I decided to combine the two. ​Mix in high speed the butter, egg and sugar for 5 minutes or until becomes a light yellow mixture. In a bowl combine the flour with the salt and baking powder. Break the mastic crystals until they are in powder form and mix with the milk and vanilla essence. Add slowly slowly and in turns the flour mixture and the milk to the butter mixture. Keep mixing for 5-10 minutes. Cut the pistachios in small pieces and add in the mixture. ​In a cupcake baking cake divide the mixture in the cups and bake for around 20 minutes and until the cupcakes get a light brown colour. While the cupcakes are in the oven prepare the frosting. Mix the butter with the icing sugar. In a bowl mix the milk with the mastic. Again break the crystals until they are in powder form. Add the milk to the mixture and beat until it becomes a fluffy frosting. Be careful not to over beat as the butter will start becoming too soft. At the end add a hint of green food colouring. Keep the frosting in the fridge until you use it. Once the cupcakes are out of the oven let them cool. Once cool cover with the frosting. 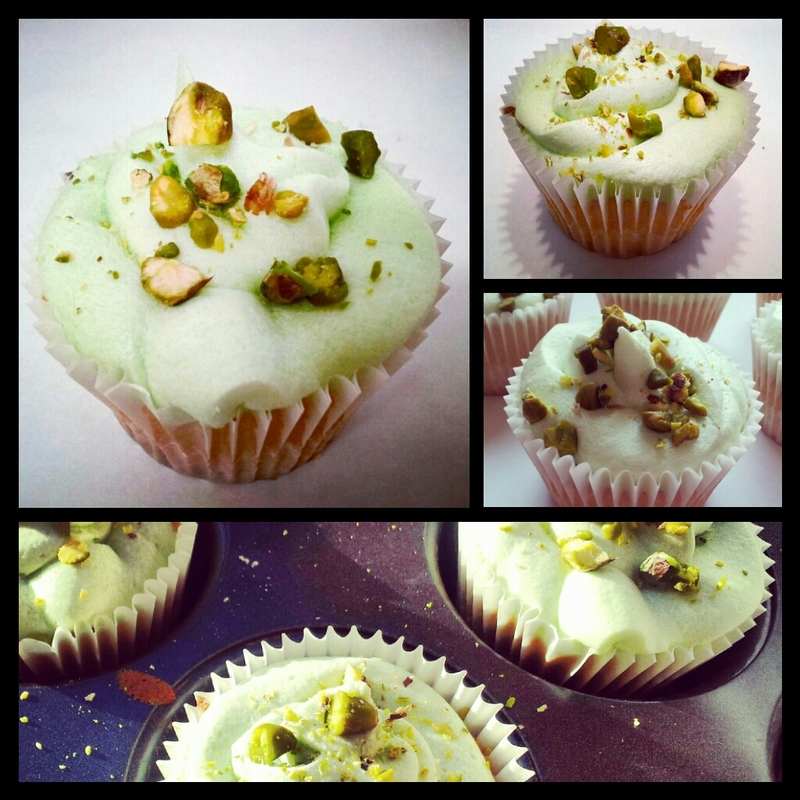 At the end break the pistachios and sprinkle the cupcakes.